Because Signs By Benchmark’s cellular plastic medium (EPS expanded polystyrene) easily allows for the manufacture of architectural accents, we are often asked to create custom pieces that will add pizzazz or elegance – for both exterior and interior applications. 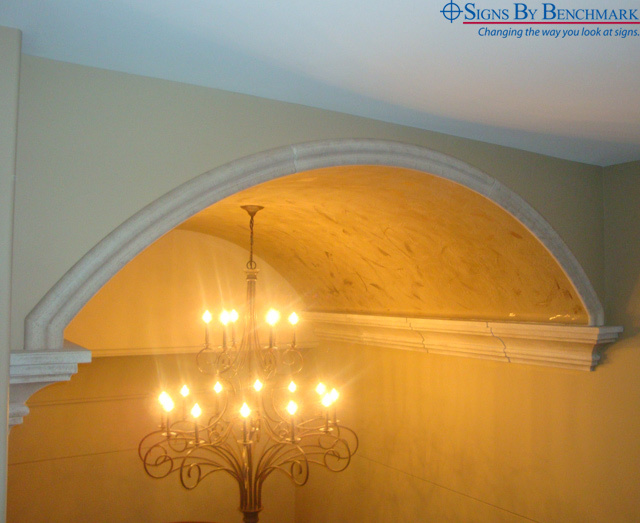 For this project, we created barrel vaulting and decorative molding for interior installation over an otherwise unremarkable building entrance. Our craftsmen worked from precise measurements to ensure an exact fit, then sealed this accent with our signature hardcoat for long-lasting durability. Once installed, the piece was artistically painted and lighted. The result is a distinctive, unique accent that attractively reflects the owner’s character and style. Think “more than just signage” when you’re working up your next project. View it in the “larger picture” mode by determining what you could offer in the way of a complete package consisting of external and internal elements. Offer signage when it’s called for, but then, knowing you can partner with us for the extras, don’t hesitate to offer much more. Give our team at Signs By Benchmark a call at 800-658-3444 to tell us about your complete package needs. Then enjoy a profitable collaboration that will leave your customers with no needs unmet. To view photos of additional Signs By Benchmark architectural accents, click here.